Introducing One of the most unique features of Serra Plaza! Personality; the combination of characteristics or qualities that form a distinctive character. One of the most unique features of Serra Plaza is the beautiful fountain that serves as a centerpiece to the courtyard and a perfect way to add your personality. At first glance, you notice its beautiful architecture and the ambient trickle of the water. 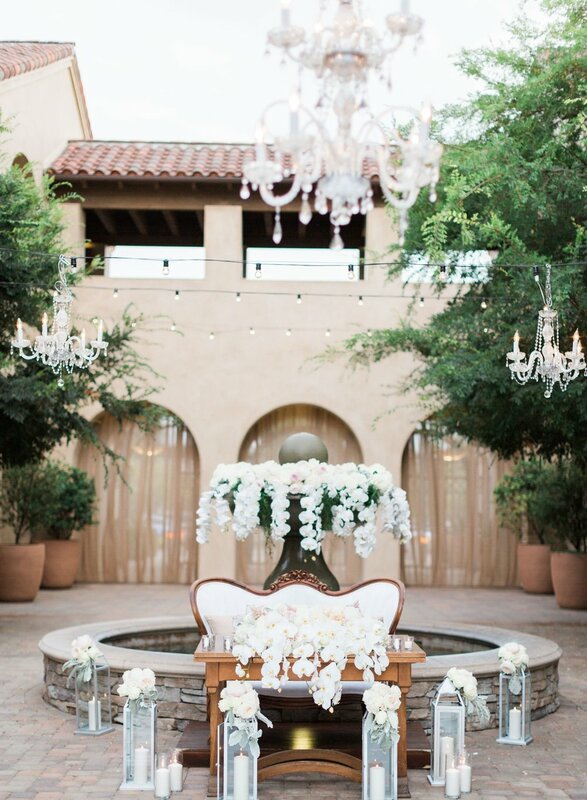 Upon further review, you will envision your special day right in that very spot and the ideas will start flowing like the water in the fountain. One of the best ways to add your own personality to the courtyard is thorough adding a floral display to the fountain. Arrangements range from simple to extraordinary and always make an impact. Although you might think the running water will disperse the flowers, its very delicate and makes for a gorgeous effect to have the water flowing from the arrangement. Another key element is that the fountain serves as a backdrop for both ceremony and reception making a beautiful statement. We can't wait to see how you show your personality through this work of art!